There is nothing worse than failing ill during your air travel. It is common to feel sick when you are flying and passengers are basically get affected by problems like sniffles, stomach bugs, respiratory infection, blood clots, and more. We at MedHouseCall are aware of these problems and want everyone to feel safe and healthy always. We are offering in-home consulting services in Ontario, Canada with an aim to improve the availability of healthcare services. Our doctors always help people and patients to maintain a healthy habit for preventing germs and infection. 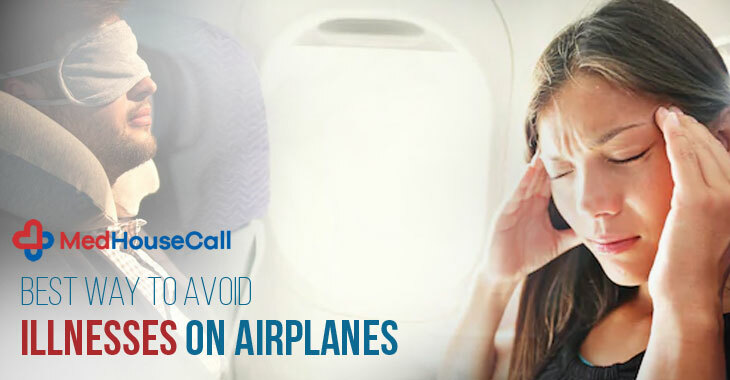 We have seen that people are often suffering from poor health when they are flying on planes. Our doctors took the matter seriously and came up with some solutions that keep you away from diseases as much as possible. Maintain this hygiene tips for you. World Health Organization always mentions the basic hand hygiene that protects the health from bacteria or infections. While you are on board, you must wash your hands with soap and water or disinfectant every two hours. You must carry an anti-bacterial hand sanitizer which contains at least 50% of alcohol. Even though you are washing your hands, you must avoid touching your mouth and eyes. Try to maintain necessary precautions when you are flying. This is another important area to consider. During your air travel, dehydration is a common health problem. This is because of the high altitude and cabin pressure. Fatigue, dry skin, and swollen lips are common symptoms. We suggest you drink at least one liter of water every four hours. Re-circulated air in planes feels almost like desert air, low in moisture. It also affects the mucous membranes of your throat and nose. Carry a nasal saline spay if you have a sinus issue. Skin looks well when the humidity level in the environment remains between 40 to 70 percent. But in airplanes, the humidity level stays around 4 to 20 percent. This means you may loss 1.5 liters for a three-hour journey. When you get into planes, you need to apply your cream every time you wash your face. Carry the sun blocking cream if you are traveling in a day and you must put the most effective hydrating cream in your bag. Bloating is very common when you are traveling. A prolonged and extended journey with high air pressure affects the air in your stomach and limb. Rotate your ankles in a circular motion. You can do simple exercises. Bring your heel up and down while keeping your feet flat on the ground. We always want you to stay healthy no matter where you travel and go. You must know the common epidemics and prevalent diseases of the country you are going. If needed, take the necessary vaccination. Carry some useful and common drugs like paracetamol. Carry a doctor’s prescription for a medical assistance. MedHouseCall is offering on-call doctor demand services to a wide region of Ontario, Canada. With the help of it, you can book a doctor’s appointment to visit your home for a treatment at any hour of a day. But, when you are traveling, these simple and easy tips will help you keep the illnesses at bay.